slowest time of the year. Holiday Market: The slowest time of the year, the Holiday Market, runs from Thanksgiving through the first couple of weeks of the New Year. and then falls for the remainder of the year. With the delayed peak, there is not as much time for the inventory to drop, so the start to 2019 is going to be the highest since 2012. The current active inventory is 58% higher than last year’s 4,323 mark. There are 2,497 more homes on the market, a lot more competition for sellers. Expect the active listing inventory to continue to drop until New Year’s Day, but it will remain elevated at levels not seen in years. 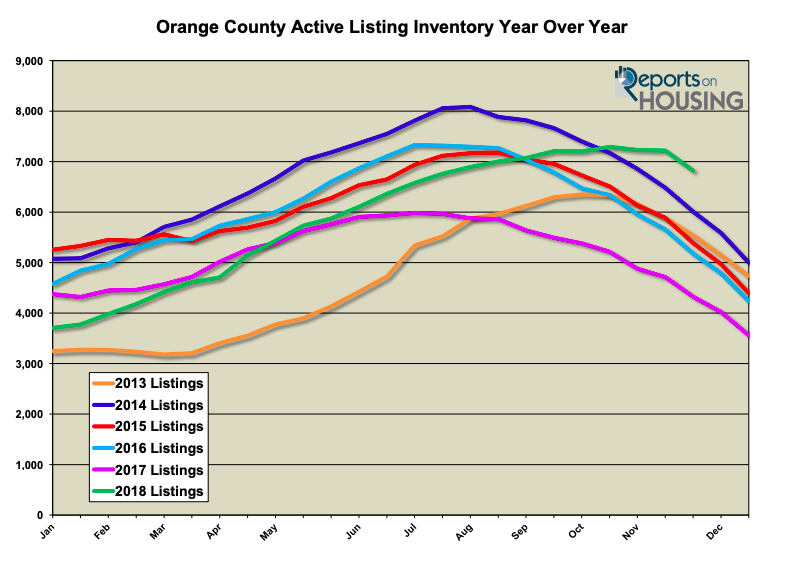 Active Inventory: In the past couple of weeks, the active inventory experienced its largest drop of the year. In the past couple of weeks, the active inventory dropped by 398 homes, a 6% drop, and now totals 6,820, its lowest level since the end of July. The Holiday Market is here and the giant drop is due to fewer sellers coming on the market combined with unsuccessful sellers throwing in the towel after being exposed to the market for months. The sharp drop will continue until New Year’s Day. From there, expect the inventory to increase. Last year at this time there were 4,323 homes on the market. That means that there are 58% more homes available today. Demand: In the past couple of weeks, demand experienced its largest drop of the year. Demand, the number of new pending sales over the prior month, decreased from 1,776 to 1,654, a drop of 122, or 7%. That’s the biggest drop so far this year and its lowest level since the start of January. We can expect demand to continue to steadily drop through mid-January. Last year at this time, there were 428 additional pending sales, 26% more. Luxury End: The luxury housing market continued to slow considerably. In the past two-weeks, demand for homes above $1.25 million decreased by 25 pending sales, an 11% drop, and now totals 209. It dropped to levels not seen since the beginning of January. The luxury home inventory decreased by 89 homes and now totals 2,039, a 4% drop. The overall expected market time for homes priced above $1.25 million increased from 273 to 293 days over the past two-weeks. Year over year, luxury demand is down by 27 pending sales, or 11%, and the active luxury listing inventory is up by an additional 454 homes, or 29%. The expected market time last year was at 201 days, significantly better than today. For homes priced between $1.25 million and $1.5 million, in the past two-weeks, the expected market time remained unchanged at 182 days. For homes priced between $1.5 million and $2 million, the expected market time decreased from 235 to 222 days. For homes priced between $2 million and $4 million, the expected market time increased from 340 to 397 days. 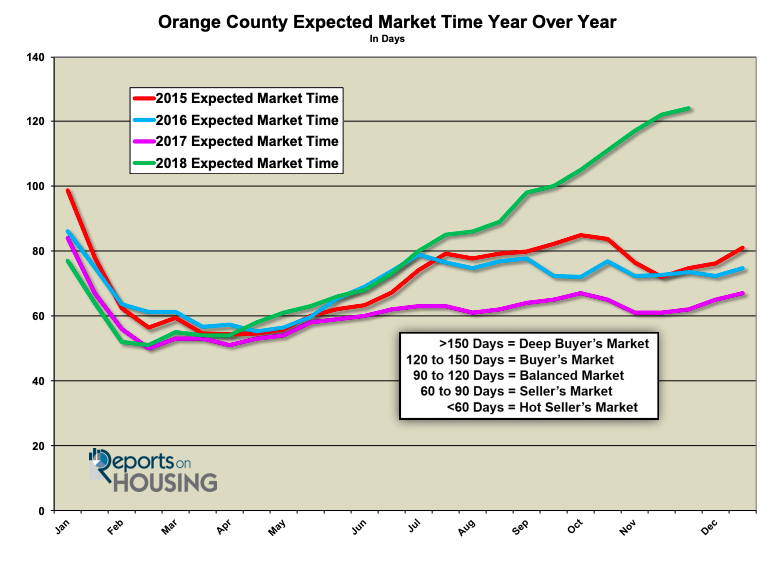 For homes priced above $4 million, the expected market time increased from 484 to 716 days. At 716 days, a seller would be looking at placing their home into escrow around the middle of November 2020.